What is Computer Access? When we talk about computers we are referring to hardware and software products that enable people with disabilities to access, interact with, and use computers. Assistive devices in this category includes modified or alternate keyboards, input and pointing devices such as large “mice” or switches activated by pressure or some other means, and software including speech-to-text software. Even if the device is a “generic” product (e.g. a “vertical” mouse or large trackball), the product is considered assistive technology if it is needed by someone with a disability. Computer operating systems now come with many “built in” accessibility features that may provide sufficient support when “turned on” and customized for the user. When do I need to use AT for Computer Access? AT may be needed at any time and in many places. Whether in school, work, or in the community, computer use is important in all areas of our lives. Who needs Computer Access AT? Anyone struggling with the three functional barriers: 1) providing computer input 2) interpreting output, and 3) reading supporting documentation. 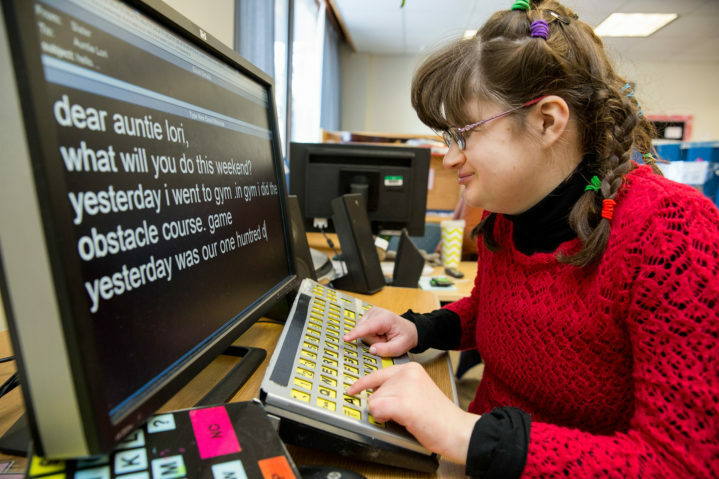 Individuals with motor, sensory, cognitive or learning disabilities all can benefit from assistive technology options. Why aren’t computers more accessible? Too often, people think of accessibility as an add-on to a device or program. Increasingly today, developers and designers are realizing that maintenance becomes easier when accessibility is part of the basic design. Now, many smartphones, tablets and computers also include screen readers, word prediction and speech recognition. 1. Consider the built in accessibility – built in features allow you can use the computer without added on assistive technology. There is speech to text dictation, magnification, text to speech narration, on-screen keyboard, mouse settings all built in all computers, tablets and phones. 2. Keyboard commands make software more accessible to all. Some people simply prefer using the keyboard instead of the mouse. For others who may have difficulty using the mouse, key commands offer an alternative control method. They are very helpful for employees those who are trying to navigate software and the internet and for customization activities. 3. Can’t access a “regular” keyboard, an employee may benefit from an onscreen keyboard. It is important to consider the physical layout or organization of the keys when selecting alternate keyboards. If an add-on keyboard besides onscreen is deemed necessary there are many choices of keyboards. They make large keys, color coded, and different layout keyboards. There are also smaller keyboards for small fingers or even a one handed typist. The category of Education encompasses learners - young and old - who are participating as a student whether at the pre-school, elementary, middle/junior or high school levels. It also refers to those attending post-secondary institutions, vocational training programs, and adult education classes. For students transitioning into the community or employment settings upon high school graduation - To ensure successful AT transitions for students aging out of school services, it is important for any AT the student is currently using or may need to pursue employment outcomes, whether written into the child's Individualized Education Program (IEP) or not, be incorporated into the student's Individualized Plan for Employment (IPE). IPEs are developed through collaboration with your state vocational rehabilitation agency using a Vocational Rehabilitation (VR) Counselor. For students transitioning into college or other higher education programs - Students transitioning out of high school into college or other higher education institutions should explore AT needs in advance of enrolling in classes. Meeting with the school's student disability services office is one key element in anticipating issues and exploring situations. Students may need computer access within the classroom where instruction occurs, as well as at home (for homework and when “school” is home-schooling, cyber-school, or on-line courses). They may also need computer access at sites that are providing internships or community-based instruction, or community resources needed to complete educational assignments (e.g. public library). What are examples of tasks or activities for which a student needs Computer Access AT? Student is Pre-K, 4 years old, and has Cerebral Palsy (CP) with physical limitations. She cannot access the keyboard on the computer like her peers. She has tried various adapted mice, alternative keyboards and switches. She enjoys playing on the computer and looks forward to computer time every day. Possible Recommendations: In this case study, the student will trial different switches along with a Switch Interface Pro. The interface has five ports to plug in multiple switches and provide the flexibility of emulating everything from a single-click to a return. Trying different switches would allow the student to find the best access site possible. Using a jelly bean switch provides the most reliable access and a larger target area. It has 4 colors to coordinate which color activates different functions when using more than one switch. Goals and Outcomes: The student will show increased participation in activities on the computer. She will work to be able to play and pause a music player, and turn pages in an eBook. This student is in 6th grade, 12 years old, and struggles with fine motor control. He cannot write with a regular pencil. He has tried various pencil grips and other alternatives. He is able to do some things with his hands such as pushing larger buttons, and he truly enjoys working on the computer. Possible Recommendations: In this case study, the student will trial many different options of technology. Starting with a low-tech solution such as a Fusion to type notes and homework. Assignments could be completed with this device. If that works but is not efficient enough for the student there are more advanced technology options to consider. Higher tech solutions could be a Chromebook, computer or laptop with dictation software. With these options the student uses speech-to-text software to type. This would help the student participate in more class activities and homework. Goals and Outcomes: The student will show increased participation in the classroom. The student will initiate the use of the technology in the classroom and show an increase in the number of assignments submitted. This student is a senior in high school, 17 years old and survived a skiing accident but broke his third and fourth vertebrae. He is now confined to a wheelchair as a quadriplegic. He has retained good head and trunk control and can move his right arm minimally from the shoulder. He has good movement in his thumb, index finger and second finger of his right hand. He is very motivated to complete his regular high school program and get back to his after school job. Possible Recommendations: In this case study, the student will start by trialing different adapted keyboards. An on-screen keyboard is appropriate for this situation. This allows the student to choose the adapted mouse that fits most comfortably in his hand and keep him from having to worry about access to an external keyboard. The on-screen keyboard can be adjusted to the student's need. Goals and Outcomes: The student will continue finishing high school and resume his after school job by accessing a laptop computer. He will also become more independent and not need a full time aid in school and graduate on time. For individuals transitioning into employment settings upon high school graduation - To ensure successful AT transitions for students aging out of school services, it is important to have access to any AT needed to pursue employment outcomes including in the application process. One option may be to investigate your state's vocational rehabilitation agency to develop an Individualized Plan for Employment (IPE) which should include any needed AT. Q - Where can I obtain more information and/or try some computer access options? A - You can contact your State Assistive Technology Program who can provide information and assistance, an interactive demonstration of available options and the opportunity to borrow a device so you “try before you buy.” These services are usually free of charge. To find your state program go to Find Your State Program. Q - When can I ask for an assistive device to be used for employment purposes? The category of Community Living encompasses carrying out daily activities, participating in community activities (e.g., social and recreational activities), using community services (e.g., public transportation and libraries) and living independently. The category is applicable to individuals with disabilities as well as family members and others providing support and care. When options are needed to increase independent functioning and participation, there are a variety of possible AT solutions. Regardless of age, the ability to use a computer for tasks and to access the Internet, email and social media is more important than ever. This child is 2 ½ years old, and has physical limitations. She cannot access any form of tablet or computer. She is extremely smart and wants to play on her mother’s iPad. We would start by trying different switches. The best solution seems to be the Blue2 Bluetooth Switch since it provides wireless Bluetooth access to your desktop computer or mobile device with multiple assistive technology options to fit an individual's special needs. She can start using an iPad and eventually move over to a computer and start playing games and learning her ABC’s. Goals and Outcomes: The student will show increased participation in activities on the iPad and eventually a computer. She will be able to play educational games and increase her cognitive abilities. 38 year old female veteran that had a brainstem meningioma in 2006. She has mild visual impairment and severe to profound dysarthria. Her attention span is good and her memory is intact. She is living at her parents’ home and wants to be able to start emailing and shopping again. We would start by trialing different mice and keyboards to access her computer. First we would start with the mouse and try a trackball, sticky keys, joystick and enlarge the cursor and pointer. As for the keyboard we would start with a mini keyboard and a big keys keyboard and on-screen keyboard. Goals and Outcomes: The goals will be to practice shopping on websites with the help of her parents until she can access the computer and shop independently. She will continue improving her computer skills using the big keys keyboard, enlarged cursor and joystick mouse. Hopefully she will then begin to prepare to go back to school. A grandmother has been placed in a nursing home. She is not close to family and would like to interact with them some technological way. She spends her days in her bed and seeing family when they can’t make it to the nursing home would definitely cheer her up. We would recommend accessing a computer for Skype, Facetime on an iPad or trying our Double Robot. Double Robot will all her to access your family through the iPad on a robot stand. Family can log in and spend time with her. The robot can move around and follower her and also be present when the doctor comes to visit and they can listen and watch the visit. Goals and Outcomes: The goal would be to independently access the robot and control it. She would then be able to contact her family anytime. The family will be able to contact her also and see the doctor in person to ask questions and play an active role in their grandmother’s care.